Readers of virology blog often request explanations of specific experimental techniques. Methods such as complement fixation, deep sequencing, ELISA, PCR and many others are frequently mentioned on this blog without discussion. To do so would interrupt the scientific discourse and make for lengthly posts. To remedy this shortcoming, I have added a new tab to the first page of virology blog called Virology Toolbox. This page will be populated with explanations of experimental techniques used for the study of viruses. Today’s technique is the western blot. 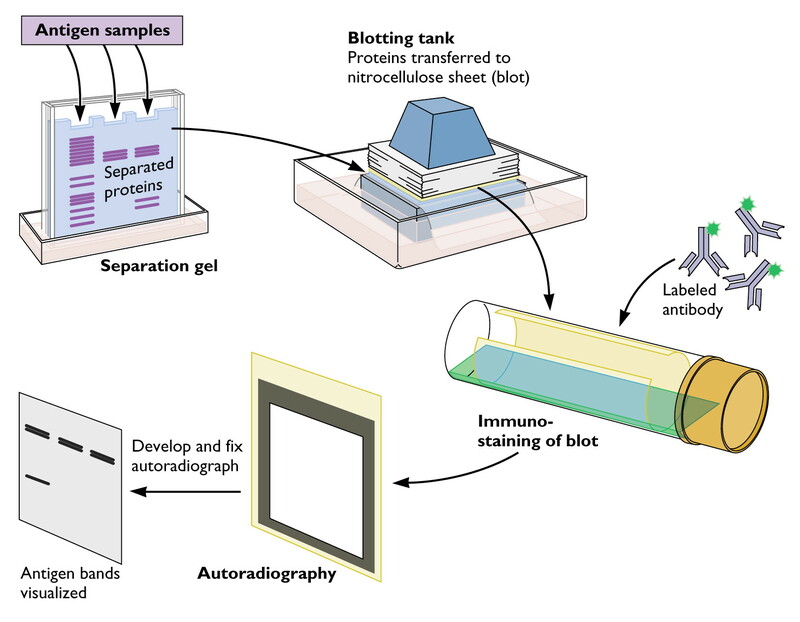 Western blot analysis (also known as immunoblotting) is used to detect a specific protein in a cell, tissue, organ, or body fluid. The technique depends on the reaction of an antibody with a protein that is immobilized on a thin membrane (click the figure for a larger version). The sample is solubilized with detergent, and the proteins are then separated by electrophoresis in a polyacrylamide gel. After electrophoresis, the gel is placed next to a thin, synthetic membrane that has a strong affinity for proteins. In the figure, the gel and membrane are placed between sheets of absorbent paper in a blotting tank. This arrangement allows buffer to flow across the gel and through the thin membrane. As a result, the proteins in the gel are transferred to the membrane by capillary action. Transfer of the proteins to the membrane may also be accomplished by an electrical current. After the transfer step, the membrane is incubated with an antibody to a specific protein. This antibody may be produced in an experimental animal such as a mouse or rabbit, or in cells as a monoclonal antibody. The antibody may be coupled to an enzyme which can then be used to detect the antibody on the membrane. In the example shown, the antibody is coupled to horseradish peroxidase. The membrane is incubated with a substrate that is converted to a luminescent compound after reaction with this enzyme. A sheet of X-ray film is then placed next to the membrane, which allows visualization of individual proteins. In a variation of the technique, an unlabeled first antibody is used to bind the protein on the membrane, and a second antibody, directed against the first antibody, is used for detection. The main advantage of western analysis is that it does not require isotopic labeling of proteins and can be used with tissues and organs, as well as cultured cells. 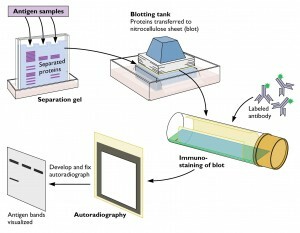 A variation of the western blot is used to identify antibodies to human immunodeficiency virus in clinical specimens and donated blood. Viral proteins are fractionated by electrophoresis and transferred to a membrane as describe above. The membrane is then incubated with the clinical sample. If antibodies against HIV are present, they will react with one or more of the viral proteins on the membrane. Such an assay is being used to estimate the extent of infection with the retrovirus XMRV in the general population. Note that the w in western blot is not capitalized. The n of northern analysis (a method in which RNA is detected on a thin membrane) is also lower case. However, Southern analysis deserves a capital S – it’s the last name of Edwin Southern, who in 1975 developed the technique for detecting DNA immobilized on a membrane. You rock! Virology made accessible, comprehensible, relevant, and even fun. You're turning me into a geek. My goal is to add one method a week to the virology toolbox. Requests will be taken! pcr! You and the guys talk about it all the time on TWIV, and I think you and Alan have sort of discussed how it works, but a visual would be wonderful. Ouchterlony plates? I know, it's more an historical technique than anything else, but still pretty nifty. You have covered plaque assays. Just wanted to add my sincere thanks as well. The w in 'Western blot' is capitalised in the original article (Burnette, 1981) following the 'geographical' naming convention in honour of Edwin Southern. 'Western' should not be used in the (lower case) adjectival sense as there is nothing 'western' about the technique. what if we use ELISA kit antibodies to detect proteins? i wanted to detect the presence of a dengue viral protein using western blot. i used highly IgM positive dengue patient sera as my primary antibody and then anti human IgM antibodies tagged with HRP, as a secondary antibody. After incubating the NC membrane with TMB substrate i was not able to get any results at all.. the secondary antibodies i used were from a commercial ELISA kit for Dengue. Could that actually hinder the reaction in some way? Previous post: TWiV 89: Where do viruses vacation?